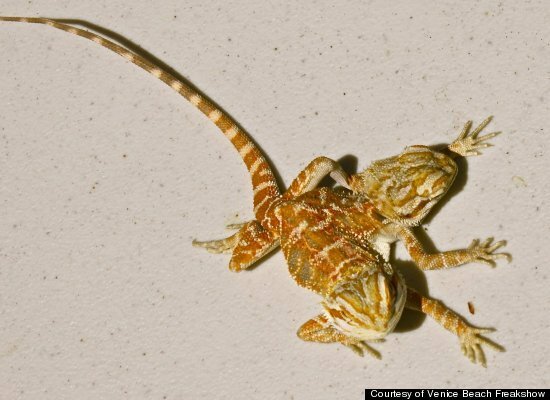 This bizarre bearded dragon lizard called Pancho and Lefty not only has two heads but it also has a split personality as one head is vegetarian and the other is a meat eater. “Pancho eats the crickets and Lefty is vegetarian. He only eats greens,” says owner Todd Ray. Todd Ray doesn’t just won one two headed bearded dragon he owns two. His other bearded dragon is called Jeckyl and Hyde. Jeckyl and Hyde have very different eating habits from Pancho and Lefty. Luckily, Hyde’s eye is responding well to treatment. Todd Ray displays his pair of two-headed, six-legged bearded dragon at the Venice Beach Freakshow in Los Angeles. 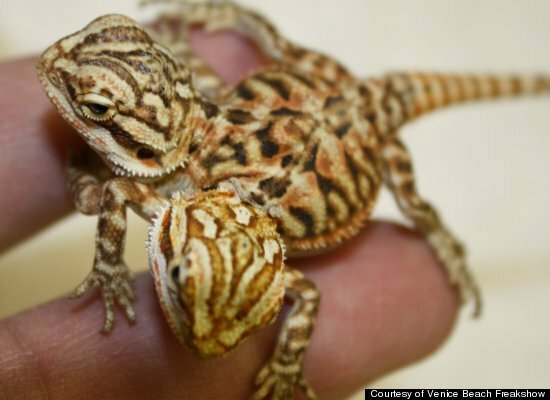 Although bearded dragons can be put in the same cage, Ray is not going to introduce Pancho and Lefty to Jeckyl and Hyde. really i love these pics.